Myron Bolitar's father's recent heart attack brings Myron smack into a midlife encounter with issues of adulthood and mortality. And if that's not enough to turn his life upside down, the reappearance of his first serious girlfriend is. The basketball star turned sports agent, who does a little detecting when business is slow, is saddened by the news that Emily Downing's 13-year-old son is dying and desperately needs a bone marrow transplant; even if she did leave him for the man who destroyed his basketball career, he wouldn't wish tsuris like that on anyone. And he's not at all interested in getting involved with Emily again, not even to track down the one mysterious donor who may be able to save the boy. But when Myron learns that Jeremy Downing is his own son, conceived the night before Emily and Greg Downing married, he embarks on a search for someone who disappeared a lifetime ago. And what he finds leads him to a powerful family determined to keep an old secret, a disgraced reporter who may have plagiarized a novel to create a serial killer, a very interested FBI agent, and a missing child. Edgar Award-winner Harlan Coben brings us his most astonishing -- and deeply personal -- novel yet. And it all begins when Myron Bolitar's ex tells him he's a father ... of a dying thirteen-year-old boy. Myron never saw it coming. A surprise visit from an ex-girlfriend is unsettling enough. But Emily Downing's news brings him to his knees. Her son Jeremy is dying and needs a bone-marrow transplant -- from a donor who has vanished without a trace. Then comes the real shocker: The boy is Myron's son, conceived the night before her wedding to another man. Staggered by the news, Myron plunges into a search for the missing donor. But finding him means cracking open a dark mystery that involves a broken family, a brutal kidnapping spree, and the FBI. Somewhere in the sordid mess is the donor who disappeared. And as doubts emerge about Jeremy's true paternity, a child vanishes, igniting a chain reaction of heartbreaking truth and chilling revelation. Wow-even the ending has twists! Myron Bolitar, "investigative" sports' agent, is confronted by his ex-flame, Emily Downing, who broke his heart. She tells him that Jeremy, her 13-year-old son, needs a bone marrow transplant. A donor was found but has now disappeared. When Myron hesitates, she gives him the dates and says do the math. Myron is shocked when he realizes what this may mean. Could Jeremy be the result of their one last fling, the night before she married Greg. The man that was his arch rival, and ruined his basketball career during his first pre-season game. Myron decides to take up the cause and runs head on into layers of mystery. Is a serial killer involved. What does the reporter that interviewed the killer know. Why is there no history that the missing donor ever existed. What does a fictitious novel written years ago have to do with any of this, or does it. Why does a super-rich recluse family send their private thugs to threaten Myron. Mr. Coben is one of my favorite writers as he can tell a story with sizzle and suspense. He paints his characters such that you feel like you know them, feel their emotions, and causes you to have a definite feeling about each one. He is one of the best storytellers out there today and this 7th book in the Myron Bolitar series grabs your attention and keeps it until the last page. At the end of this novel, Harlan Coben says: "This book is a work of fiction. That means I make stuff up." For the first time, I disagree with him. I have read every one of his seven novels, and he doesn't just make things up - he uses his magic pen to pull rabbits out of hats, Aces from his sleeve, bouquets and doves out of and back to nowhere, and a few ropes tricks for good measure. He is a Master Magician---never ceasing to surprise and amaze--a grand mixture of tears and laughter, suspense and release, yet provocative and insightful. This review does not concern what the book is about, but is rather ABOUT THE BOOK. It is a roller coaster ride - Harlan takes you up the slow grade to the top of the rise and sends you hurtling down full speed; around curves, over the top, through the loops and then starts the long slow climb again. Hang on!! His characters are perfection: Myron Bolitar: hard as nails yet soft as a marshmallow - intuitive, intelligent, analytical, sweet and loving, cute and cuddly, human and feeling - you name it: that's Myron-- but don't underestimate him, that mind of his never stops working. Esperanza: Myron's sidekick, friend, advisor - beautiful, intelligent and ever faithful! Windsor Lock-Horne the Third: A devoted friend, almost unfeeling, cold and calculating in every way except where Myron and Esperanza are concerned. Aptly named - you really wouldn't want to lock horns with him!!! The quick wit and spontaneous interaction of these three will keep you reeling as Harlan spins his web of intrigue and mystery. But read his books and see for yourself. According to his answer to my e-mail, this talented author will be giving Myron and Company a rest for a "coupla years" (but he assures me they will return!) In the meantime he is at work on a 'stand-alone" novel called TELL NO ONE, with a new cast of characters. My advice is to start with his first novel and watch the characters grow right before your eyes(so to speak. And wait till you meet BigCyndi! But that's another story!Enjoy as you have never enjoyed before...I did. Coben has added new depth to his character, Myron Bolitar, and explores the relationships with family and lovers in a most profound way. This is the best of the Bolitar books. Last one of the Series? I just finished the novel, and as usual, found it very entertaining. I have read all the books in the series, and find the character development extremely interesting. Harlan does a great job of developing the characters, and there is some flow from book to book, but a short "recap" is always helpful, but never too boring. I really enjoyed this book (along with all of the other in the series). The plot was ok, but what make a Harlan Coben book so good is the character interaction. The wit and humor between the characters make you feel like you are listening in on the conversation "first hand". The characters are "ongoing" but Harlan does a great job of recapping them without being boring. First time readers can pick up anyone of his books and not get lost in the character development, like with some other authors, who write "series" type novels. As I've stated in other reviews, I'm a big fan of Harlan Coben, who I consider one of the best suspense writers in the business. Although Coben is best known for his standalone thrillers, he has also written a well-received series involving Myron Bolitar, a sports agent who solves crimes. DARKEST FEAR is the seventh book in the series, and it's an okay read. DARKEST FEAR is good, but not nearly as strong as the two books that came before it, ONE FALSE MOVE and THE FINAL DETAIL. The plot is too outlandish and dramatic for its own good, and involves a major coincidence (a serial killer connected to a bone marrow donor connected to a boy who may or may not be Myron Bolitar's son) that would never happen in real life. The plot of DARKEST FEAR is also too convoluted for its own good, especially toward the end, when Coben tries too insert a few twists too many. I enjoy plot twists in a book, but an overabundance of them can ruin the natural flow of a story, which is pretty much what happens here. Coben is justifiably famous for his multi-layered plots, which sometimes work brilliantly (TELL NO ONE, GONE FOR GOOD, and ONE FALSE MOVE) and sometimes feel labored and contrived (BACK SPIN, THE WOODS). I would put DARKEST FEAR in the latter category. Myron Bolitar, sports agent and mystery solver, becomes involved in the search for a bone marrow transplant donor to save the life of an old girlfriend's young son. Myron appears to be maturing in his latest adventure, but the novel is still laced with humor and enough plot twists to keep the reader involved until the end. This is the first Bolitar mystery in which sports is relegated to the background, although Myron's usual supporting cast remains front and center. Another excellent Myron Bolitar book! A real churner - don't wait for the paperback. Darkest Fear is the 6th and most recent Myron Bolitar story and it starts with a whopper of a revelation. Myron learns from an ex-girlfriend that he is the father of her 13 year old son. If that wasn't enough, the boy is in desperate need of a bone marrow transplant and will die without one. A matching donor was found in the national registry, but no one can locate him and Myron is in a race against the clock to find this mystery man before his son dies. At a time when MB SportReps is still reeling from the clients it lost while Myron was secluding himself on a Caribbeanisland, Myron must balance the need to keep his business afloat with the frantic search for the man who holds the key to his son's future. While trying to contact the man, Myron stumbles across a serial killer that the FBI has been searching for. He gets involved in the search and meets a journalist who claims to have interviewed the man but refuses to reveal his identity. Is this killer somehow linked to the marrow donor than Myron so desperately needs to find? Take Care. Take Great Care. I loved the book. The plot and conversational dialog is outstanding. When the charcters have something to say, Harlan makes you feel like you are right there listening to them. Harlan's development of the characters in this series is outstanding. There is an ongoing development of the characters, but the writing style is such that you can follow the character development without having to read each and every one of the books to keep up with the characters. There is always a short "recap", but never too long and boring. The "father/son" touch and the call to the social issues (bone marrow transplants) was wonderful. Done in a way that makes you aware of them, but without the "soap-box". I only just discovered the Myron Bolitar mysteries this winter. If you are even later to the party than I was, don't stop to read all the reviews, go out and get every book in this series and read them in order. They are that good. I think there is enough background in this book that one could enjoy it without having read the earlier ones. But Myron goes through some emotional changes in this book that you won't fully appreciate unless you have read at least a couple of the earlier books. The emotional layer to this book is why it is my favorite so far in the series. The scenes with Myron and his dad are just tender. His reaction to learning he has a son and the lengths to which he will go to save his son add to an already complex and human character. But don't worry, there is still plenty of action -- Coben didn't turn this into a chick lit book! And speaking of action, Win is fascinating as usual; if he weren't one of the "good guys" he'd be a psycho killer. Well, I guess he actually is a psycho killer, but in a good way. Greg and Emily are returning characters from an earlier book in the series. It would be better to read that one before this to get the full emotional flavor of those relationships. Does The Means Justify The End? You will be asking yourself this by the time you get done this story. Myron must use some ruthless tactics in this one to try and save a person's life and this person is very important to him. Of course ruthless is Win's middle name and he has no remorse when it comes to dealing with evil with his Sixth Degree Black Belt mind and body. Albeit the book digress of the main plot once and again it'll keep you interested in the story. You'll have some inklings of who is the bad guy but only at the book's end and then you'll ask yourself "of course why didn't I see it before?" Once you reach half the book you won't be able to stop reading. The latest Myron Bolitor belter (As we say in the North east of England) He just gets better. Seldom have I read an author who's books just get better and better. It's supposed to happen of course it is but all too often once the author is a sure fire hit the publisher turns the screw and pushes the author page by page desperate for the next blockbuster. Result- not good- a rushed product the style goes and the plot loses.. well... the plot! 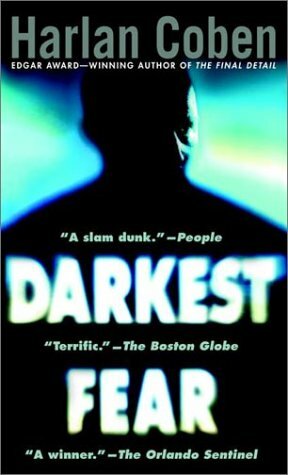 Darkest fear, by the brilliant Harlan Coben, is the 7th book to feature sleuthing sports agent Myron Bolitar and the series memorable cast of characters. Myron is shocked when an ex-girlfriend shows up at his door with news that he has a son and that the son has a life-threatening illness. This is a story about family and how far they will go for eachother. Win is here again and is as fun and witty as ever. This is a silver bullet of a novel that is darn near impossible to put down. The mystery here is excellent, what starts out as a simple story turns into a dark scary story involving kidnappings and a serial killer. Coben weaves his magic yet again. One of the finest - if not the finest - mystery/suspense writers on the planet, this is another 5 star thrill ride that is not to be missed. I strongly suggest starting at the beginning of this series soe as to truly enjoy the character development. DARKEST FEAR - BRIGHTEST HOPE! This was the most powerful of Myron Bolitar's series. I could not put this book down. Every parent who reads this will feel the same. Dynamite! Am almost caught up with Myron and Win's escapades and they are indeed exciting. Emily hits Myron below the belt with a shocker and asks him to find the elusive and possibly the only bone marrow donor match for her son. Myron finally agrees and it is one terrific ride. For me, the best line in the book was Esperanza sayng to Myron: "No child could ever be harmed by having you in his life." Powerful words; powerful book. Coben At His Best - A Review of "Darkest Fear"
Seth Godin is a marketing guru and a prolific writer. One of my favorite books by Seth is "Free Prize Inside." Godin reminds us of the thrill we experienced as kids in opening up a cereal box to dig for the free prize buried amongst the Corn Flakes or Cheerios - a whistle, a decoder ring, a puzzle. His premise is that the best companies and the best brands offer something extra - something beyond what the consumer expected when he purchased the product or the service. This seems to be an apt description of what Harlan Coben offers as an author to his loyal readers. Hidden inside the box of each of his mystery genre novels is something extra - an unexpected exploration of some aspect of human nature that takes the reader to a depth not usually experienced in a suspense novel. In the case of "Darkest Fear," Coben stands on the shoulders of Turgenev and explores the relationships between fathers and sons. Without his free prizes inside, it is possible that his Myron Bolitar series could have devolved into him cranking out a string of formulaic page-turners. To his credit, Coben has opted for doing the harder work of mining deeper veins of insight and understanding - hidden within the bedrock of murder, mystery, intrigue and non-stop action. In "Darkest Fear," Coben's exploration of the vagaries of fatherhood is set within the story of the kidnapping of a child desperately in need of a bone marrow transplant. Myron and Win are called upon to find not only the boy - but also a missing bone marrow donor. The plot twists are breathtaking and brilliant. Myron started to open his mouth, but Chase waved him quiet. The words made Myron cringe. Myron swallowed down the clich¨¦s. Chase took deep breaths and reached for the bar. `Need a spotter?' Myron said. Chase Layton gripped it and jerked it off the stand. It is because of this kind of writing that I keep returning to read one more book by Coben. As far as I can tell, I still have one more book in the Myron Bolitar series I have not yet read. Stay tuned! One of my favorite authors! Harlan Coben continues to prove that he is one of the best thriller writers around at the moment. A page turner is a much used phrase but in this case it is really appropriate. The author's books are always so well structured and his character's well rounded. He is obviously comfortable with his style and ability and this transmits itself to the reader making the reading of his books sheer pleasure from start to finish. Coben has now got a string of best selling crime novels behind him and all I can say is that I hope he continues to write for many years to come. The author lives in New Jersey with his wife and four children. Myron Bolitar, ex-professional sportsman and currently a sports agent still has quick reflexes, but he never saw this one coming. His ex-girlfriend turns up with news that stuns Myron. Her son, Jeremy is dying and needs a bone-marrow transplant. The donor has vanished without trace. But what she tells him next is the punch that almost brings him to his knees, the boy is Myron's son, conceived the night before his ex girlfriend married another man. Stunned by the news, Myron pulls out all the stops in the search for the missing donor, but the deeper he digs the darker the mystery becomes and doubts begin to emerge about Jeremy's true paternity . . .
Mryon Bolitar does not stop to amaze me. The credit goes to Harlen Coben for his latest flicker "darkest fear". This time, Myron is been entrapped in his own emotional shell when he learns about his son. His son will die if he does not get a bone marrow transplant. But, the person whose bone marrow matches has disappeared. Now, its upto Myron and Win to get the guy back else his son will die. This plot leads to a thicker web when myron accidentally comes across a serial killer. Now, the cops, FBI and an privately guarded millionarie family ia after myron. "Honey?" Remember the time . . . ? I have to admit there's something very 'catchy' about Coben and Myron Bolitar. Myron certainly is the antithesis of the Ian Fleming characters. You just don't get that feeling of panache and savoir faire. Ditto Spenser and Elvis Cole. But you do get an apprecaition that he's tough when he ought to be and sees things through. And, along with that, he has Esperanza (isn't that a take off on 'esperanto,' the mingling of all forms of communication?) as his secretary-friend-advisor, and the stone cold killer thank-goodness-he's-on'your-side, Windsor Lockhorn III. Quite an amalgamation of characters. Here Myron is approached by the girl that broke his heart (don't we alll have someone who did that?) and he reacts as I believe most of us would. GO AWAY! But as some of my friends might say, 'then she lays the 411 on him' and he changes his mind. Emily's 12 year old son is in terminus if Myron can't find a mysterious donor. You Can't Ask For Much More From A Book! Sports agent Myron Bolitar's ex-flame Emily Downing, who broke his heart, comes back into his life with a sad story. Her son Jeremy is suffering from a rare disease and desperately needs a bone marrow transplant. They've found a donor, but he's vanished and Emily wants Myron to find him. And to entice him to help her, she tells Myron that he is actually Jeremy's father. Myron finds out that the donor's name matches that of the son of a wealthy, prize winning author. He mysteriously disappeared as a young child. Now his name appears again. Myron's attempts to find him have him at odds with the donor's family, who refuse to give up his identity or where he can be found. Myron also finds out that there is a serial killer in the mix who may or may not exist. The killer was profiled in a series of articles by a reporter who allegedly made the stories up with the help of an old novel. When Myron tries to talk to the reporter, the FBI gets interested and and that interest has Myron struggling to get to the bottom of just who the real donor is. Could he be the serial killer?